Image courtesy of Bexhill Museum. Arriving in Borneo and focus shifts from Annie’s “A Voyage in the Sunbeam” (1878) to her posthumously published “Last Voyage” (1889). Borneo, and the caves therein, triggered the deterioration of her health after catching a fever. Annie had suffered with her health for a long time, particularly with malaria, although she also commented on her arm troubling her at times, thought to be due to a riding accident (Julian Porter, curator, conversations at Bexhill Museum). The caves in Borneo and the story of their role in Annie’s deteriorating health are the reason I included Sabah (Malaysian Borneo) in my itinerary. Transfixed by the existence of the caves and discovery that the birds’ nests she went in search of, now held at Bexhill Museum, committed me to this journey and planted the seeds for this residency (and ‘In Conversation with Annie‘). 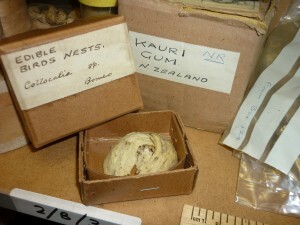 Birds’ nest, courtesy of Bexhill Museum. Annie’s interest with Gormatong and Madai caves was principally the habitation of the swiftlets within and their nest building. 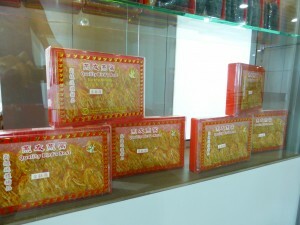 Prized for the soup, a particular delicacy in China, birds’ nests would be collected from within the caves and boiled down to make a glutenous liquid for serving. My interest was particularly piqued through Annie’s accounts detailed in “The Last Voyage” and the accompanying illustrations. It is described as quite an adventure to find said caves and the sense of far away lands are especially evident here. 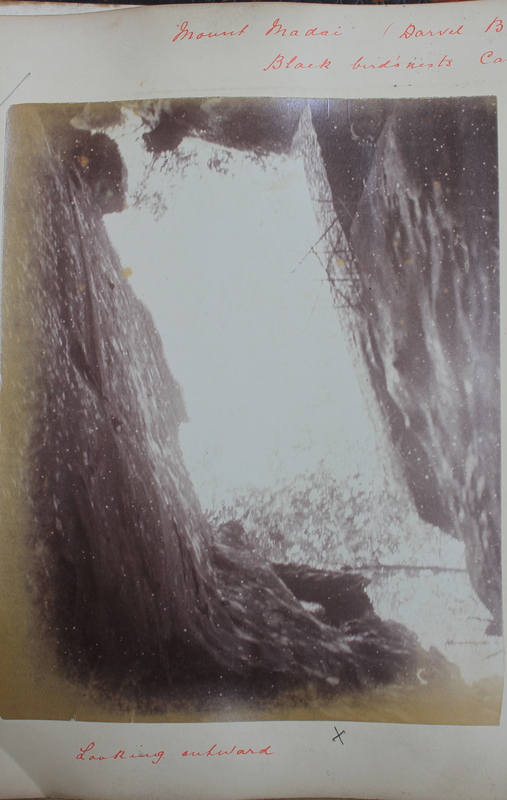 Entrance to Madai Caves, image courtesy of Bexhill Museum. Swamps and rainforest eventually precluded Annie from reaching Gormatong. 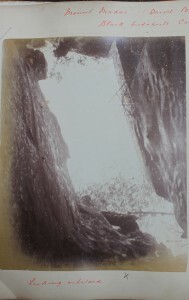 Men were sent to find the caves and she accepted defeat only after three day treks proved the challenge of reaching them. She had to be satisfied with Madai. In contrast I had gone in hope of finding Madai caves and had to settle for finding Gormatong. They were a good deal more accessible than they were in 1887, although much of Northern Borneo is still a little challenging to navigate without your own transport (and all the correct permits). They did look similar to Annie’s photographs of Darvel Valley and Madai caves and I trust smelled the same (I was fortunate to be harbouring a cold by then). The floor covered in guano, the walls in cockroaches. There were men living inside guarding the valuable bounty and rickety wooden ladders lashed together as Annie describes. 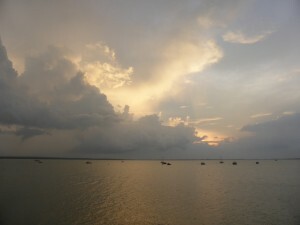 The main difference was not at the caves themselves but when I came to leave Borneo. Arriving at the airport for my flight to Australia, I spotted a shop window filled with clear perspex boxes, each filled with small white birds’ nests. This entry was posted in Artist in Residence, In conversation with Annie and tagged Annie Brassey, Bexhill Museum, bird's nests, Borneo, China, Darvel Valley, Gormatong caves, journey, Madai caves, Malaysia, soup on April 22, 2015 by Louise Kenward. After almost five months, many trains, planes, buses and boats, I have arrived in Australia. It’s a very early morning landing after a short flight over night to Darwin. I am ‘down under’. The water does go down the plug hole the wrong way, and while acclimatising myself (and waiting to be able to check in to my hostel) I am genuinely greeted with a cheery ‘G’day mate’. Cars have stopped to let me cross the road, and of the few people I have seen, I’m the only one who isn’t running. 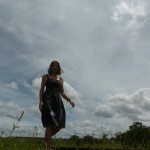 Feeling a little like Alice, I think I may have stepped through the looking glass. Just a few days here before I cross the desert on The Ghan, and I’m occupied with this being Annie’s last visit and the Sunbeam’s last port of call before she died of malaria while heading home. Annie had been unwell for some time. It was mentioned that she may have contracted malaria at the Madai caves in Borneo, although I have also since read that it could have been the Panama Canal. Either way, Annie had experienced poor health for a considerable time. Despite this, she had continued in many duties regarding the St Johns Ambulance, travelling, entertaining, writing and other Ladyship activities. She wasn’t one to be easily distracted or put off from something (see previous post). So although this is far from the end of my journey with Annie, it is a punctuation in the trip. At this stage in the Last Voyage Annie’s journal ends. Her son TAB however, also kept a journal and it is this which I refer to in learning of her last days. He writes very personal accounts of life on board the Sunbeam, tending to his mother’s bedside and day to day life as family sit all hoping she will again pull through. …The doctor who came on board to see Mother did not speak very hopefully of the prospect of the Northern Territory…Mother, who was lying on the deck had her long chair turned that she might see them [supplies of coal and food coming aboard]. She has been so terribly weak today that the doctor almost despairs of her pulling through, but in spite of this she insisted upon sorting all the letters and papers this morning…” (TAB Thomas Allnutt Brassey, 16 Months of Travel, 1887). On the 7th September the Sunbeam started its voyage on to Mauritius. One week later, on the 14th September, Lady Annie Brassey died. Passing away “peacefully and painlessly” (TAB, 1887). “…We buried her the same evening at sunset. The body was borne aft to the lee of the gangway by the four oldest hands, Mr Kindred, John Fale, Muston and Mr Jones. The doctor read the service. Father read a few words on her life instead of the lesson, and her body was committed to the deep. Nothing can be more solemn or more impressive than a funeral at sea, and it was a fitting end for her who loved the sea so well. Our great consolation is that we were all with her at the last and that these last days have been so peaceful and so quiet.” TAB 16 Months of Travel, 1887. Working with the Northern Territory Library, I have been able to trace records of the time which show the outbreak of small pox at Port Darwin and document the arrival of the Sunbeam. The Administrators report for the following year also shows the doctor who attended Lady Brassey, noted by TAB in his journal at the time. “Unhappily Lord Brassey’s visit here was made under most sorrowful as well as most unfavourable circumstances. The Sunbeam arrived on September 6th with Lady Brassey seriously ill with malarial fever she contracted on the Queensland coast [a third contender!]. …Dr Wood was called into consultation, and thought Lady Brassey’s state of health presented very serious symptoms. As is now well known with deep regret Lady Brassey expired within a week after leaving Port Darwin. [Due to the small pox outbreak at Palmerston] Lord Brassey did not think it expedient that he or any of the visitors on the Sunbeam should land. I was permitted, however, to have a long conversation with Lord Brassey from my gig, and such information as under these circumstances could be furnished was supplied.” Government Residents Report on Northern Territory for the year 1887. With thanks to Margaret and Suzy of the Northern Territory Library, Darwin for all your help and for tracking down this report for me. This entry was posted in Annie Brassey and tagged Australia, death of Annie Brassey, Madai caves, St John Ambulance, Sunbeam on February 25, 2014 by Louise Kenward. North East of Kota Kinabalu, Sabah (Malaysian Borneo) sit the Gormantong caves. One of the sites the rare and much prized bird’s nests of the apparently culinary delight from which bird’s nest soup is made from. Annie Brassey had been very keen to visit these at the time of her visit to what was then Northern British Borneo in 1878. She had been able to visit Madai caves where the swiftlets also nested. Reached more readily by boat, the Sunbeam docked at Darvel Bay from where there was quite some expedition still to reach their destination. The trip is documented well in Annie’s journal and in photographs and sketches made at the time. The nests she brought back from her trip are also still in tact and currently being looked after by the Bexhill Museum. What is also well documented is her desire to reach Gormantong. A good deal further from Darvel Bay, her journal gives the impression that she had already had someone attempt to discourage her from such a venture. Despite this Messers Wilson and Walker were sent to survey the area on foot. 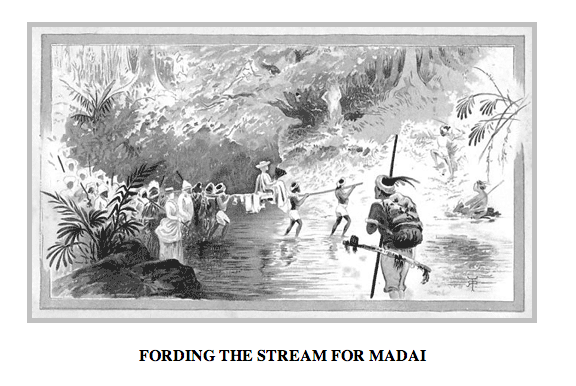 Crossing rivers, swamps, jungle and general inhospitable land, they finally reached the caves some days later. Little detail is given about the caves themselves, however, and what they found on their arrival, rather emphasis spent assuring Lady Brassey that it really would be an impossible journey for her. With great reluctance she relents and they move on. This did, however, make me curious to recreate an expedition. Not the travelling through rivers, swamps and jungle, I anticipated that some years later it would be a little easier to get to. Planning as much as I could from the UK, with time restrictions and a less than clear answer from the internet, I arranged to join a tour that took me overland through Sabah, principally because it included a visit to Gormantong caves. With extra days to spare I still held out hope of reaching Madai but if nothing else, reaching the caves that eluded Annie so, and that she so wanted to visit would certainly be good enough. Dressed in hard hat and head torch, long sleeves, trousers and fully covered shoes, I embark on my own expedition. A short walk through jungle, the orchestra was playing loudly and jubilantly. No one else was around and I wondered how much the environment had changed from the views that would of greeted Messers Wilson and Walker on their eventual arrival, and how much cursing dear Lady Brassey may have received. Long houses flank the entrance to the caves where equipment is stored for harvesting. A large cavernous opening awaits and I’m warned of cockroaches and falling guano. Nothing could deter me from going in. The central area is very tall with a small opening at the top allowing a small amount of light in, where I could see bats circling. On the ground lay a large mound of guano. Helpfully a walkway had been built around the perimeter so, unlike Annie and her group, I didn’t need to walk through too much goo. Blessed with a cold for this part of the trip my olfactory senses were blissfully hampered. The stench that kept others at bay did not bother me. The atmosphere was cool and dark, taking in as much of the beauty of the caves, the light and the structure of the rock face I was completely absorbed and almost didn’t notice two people sitting in a small wooden hut constructed to one side at the base of the caves. Wardens of the caves, they are careful to protect their valuable bounty. As in awe of the structure and the cave as I was, I’m not sure I’d actually want to live there. Reaching the sunshine again I’m a bit disappointed not to stay longer, but as with a tour I have to move on. Very very happy to have reached the caves and keen to report back to Annie. 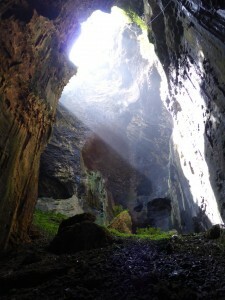 This entry was posted in Annie Brassey and tagged Bexhill Museum, Bird's-nest caves, Borneo, Madai caves, Malaysia on February 22, 2014 by Louise Kenward. Research today has focussed on the time Annie Brassey visited Borneo. In particular of the caves where bird’s nests are collected for making bird’s nest soup. I had been under the impression that a visit to one of these had been responsible for Lady Brassey contracting malaria. My journey passes through Malaysia and Indonesia and I am trying to establish the possibility of locating and visiting such a cave. ‘The Last Voyage’ documents time spent in Singapore before sailing around the coast of Borneo. This included stopping at Brunei, Sarawak and Elopura (now known as Sandakan). “I had been very anxious to go to the black bird’s-nest caves of Gomanton, but was assured by everybody that the difficulties would be found insurmountable. 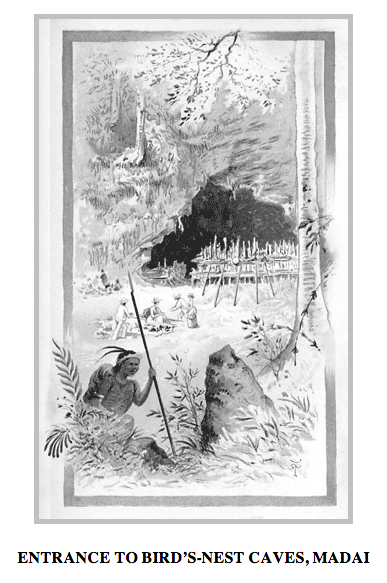 All agreed that it was absolutely necessary to await the return and the report of Messrs. Walker and Wilson, who had gone to Gomanton to survey the road…A shorter expedition has been therefore proposed, and it is arranged that we shall cross the bay and look at the bilian-wood cutting…The distant views of Sandakan are very fine, as is also the aspect of the north bluff of the island of Balhalla, where the best white birds’-nests in the world are found, and are collected at terrible risk to life and limb…we found Messrs. Walker and Wilson, now on their way back from the caves, of which they gave an interesting description. They seemed, however, to be firmly impressed with the idea that it would be impossible for us to visit them, the difficulties of the expedition being far too great for anyone unaccustomed to Borneo jungle-life. 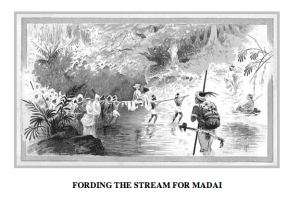 They had been obliged to swim rivers, wade through mud up to their arms, sleep in damp caves, and endure other hardships not very conducive to health in a malarious district.” (The Last Voyage, Brassey, pp178-180). Up for a challenge, I am nonetheless reluctant to be swimming rivers, wading through mud up to my arms and sleeping in damp caves. However, it is looking as though visiting the caves of what is now referred to as Gomantong Caves in the Sabah region of Malaysia, may be a little easier today. From preliminary research it seems that these are a more practical destination than the Madai caves on the North East coast of Borneo. There are a number of sketches which illustrate this part of Annie’s journeys, the one below shows Annie’s journey, the one above features the entrance to the caves. This entry was posted in Annie Brassey and tagged Bird's-nest caves, Borneo, Gomantong, Madai caves, malaria on July 30, 2013 by Louise Kenward.